It was during my stay in the jigal tree camp at Milibinyarri last year that the trees really came alive for me. I sensed their presence with new sensitivity. I took the time to be with each of these old, old beauties. This year when I returned to that camp I visited each, tried to get a sense of who each was. One had another tree growing in amongst it. They felt like lovers in each others’ embrace. There was an unusual sexual energy near that tree. I didn’t dwell long. The next tree was much older. It had offered me much firewood over the months of staying there. There was a distinct old man energy about this tree. He seemed content to just be there and for me to be there. There was no push or pull. The next two trees which grew quite close to each other felt to be women, but of different generations. This is right near where I pitched my tent. I felt nurtured in this nook and I know of many other women who have camped here and felt the same. Maybe all of these trees are part of the same family. I felt like I was camped amongst a family. Over near my makeshift shower (a hose dangling over a branch) was a big old cutclore (law, initiated men’s business) tree. I tried to give that tree space and always maximum respect. So it was from these humble beginnings amongst the jigal tree family that I started to see, but more through feeling, the other trees on the Lurujarri Dreaming Trail. S had spoken to me after trail last year about an old twisted tree at Murdudun which had pulled at her. She went weak in the legs as she passed it and had to sit with it a while. An old female tree she thought. She said it felt like it wanted her to stay for a while and just be together. I met this tree about a month ago, but not before K told me about her experiences with this tree in the mayi (monsoonal vine thicket). 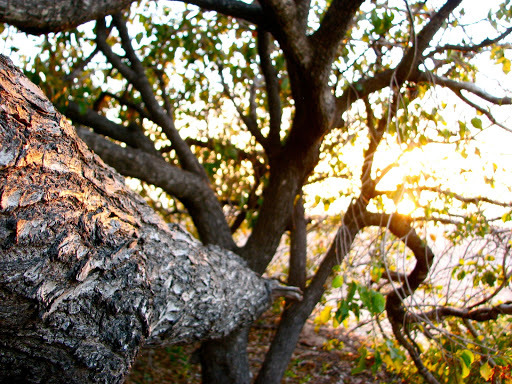 She too had come across this tree and felt compelled to be with her… sit against her trunk, climb into and rest amongst her branches, play in her presence. She is a big old twisted gulung tree with smooth bark and a sprawling canopy. A small group of us walked through the mayi, learning about the plants that fruit in this extraordinary thicket, when we came upon her. I knew it must have been her from the way K’s face lit up. Another young woman who was walking trail for the first time looked mesmerized too. She walked right up to the gulung tree and placed her hand on her trunk and smiled. That tree made her so happy. I asked her about it days later. She too felt drawn to be with this tree, she felt her strong presence. Last year T took me to her camp under two trees at Walmadany. I had always assumed that they were one, but no, they are a Marool and a Pittosporum living side by side, their canopies intertwined. It feels like an old, old camp sitting under those trees. From there you can see the sun set into the ocean, way out east over the mayi and over the dunes to the south and north. Camping under trees where you know people have camped for many years (thousands and thousands) is grounding. That ground, the trees must remember our form, drink in our heat and feel our presence. I could feel her reeling me in as we walked along the dune system from our lunch spot at Dugal to Minarriny. Not to say that the walk was effortless, it wasn’t. I was tired, worn out, but something kept me moving forward. Some kind of magnetism. She was way off in the distance, perched high up on a dune. Although she was far way, she appeared large, expansive. Walking up the final stretch of steep dune I looked up at her rustling leaves and felt a warm recognition, like a friend smiling at another in reunion. We collapsed in her shade. 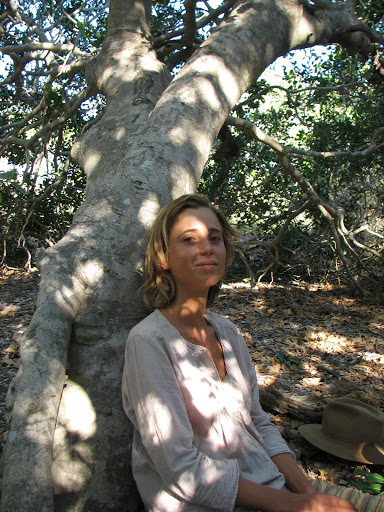 I sat with a happy feeling, a memory of being with this tree and our mob last trail. 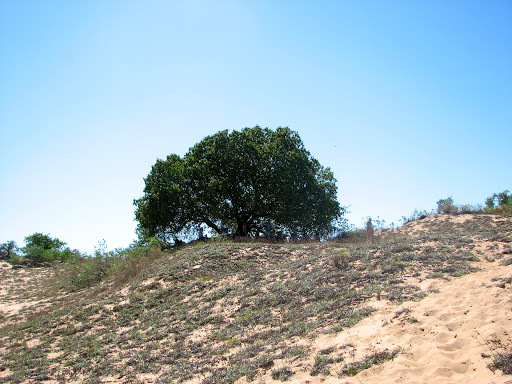 We were sitting on the side of the dune and under the canopy of the tree listening to Richard tell us a story about his mothers and this place, Minarriny, the place where their rai (spirits) come from. The density of that moment shifted as Richard’s story unfurled. We were taken into something, or in by something, consumed by something that was seeking to emerge. A story… a dreaming… I’m not sure. This tree remembered me from last year, I could feel it. I couldn’t leave her when the group pushed off to Bindiyangun, I needed more time under her canopy, more time to stay in that happy feeling. Resonance in country, a sense that my own vibrations were in harmony with those around me. That’s what I felt at this tree. It wasn’t until our final night at Bindiyangun, sitting around the billy tea fire that I thought to ask F about this tree. He said that it is a special one. A mamara (spirit) tree. People think that the Red Gubinge is a hybrid of the Marool and Gubinge trees. F has a different theory… that one tree was the original tree and it made the two different trees. A oneness and from that came more. I am a creature of habit. My camp at Bindiyangun is always on the first high dune. From here I can see down to the kitchen, that’s out east where the sun rises, and out west to the setting sun. From here I can see the yellow ochre cliffs glow when the sun is dropping low. All of country looks and feels alive from my camp. On a journey to collect firewood one night I met this jigal tree. In the dark it looked like many. I crawled under the canopy and searched in the leaf litter for pieces of wood, the stuff that burns with a bright blue flame and leaves white ash in its place in the morning. From under here it looked like there were ten or even fifteen trees, trunks rising up from the leaf covered sand dune. In the morning I went back to this tree, I could feel something strong there. Again I ducked under branches and crouched under the low canopy. Suddenly it dawned on me that the trunks sprouting up out of the sand dune were actually branches; diving down, being covered in sand and rising back up to a reach up to the sky. An old jigal tree will do this, send its branches sprawling along the ground, then back up again. It can make one tree look like many. 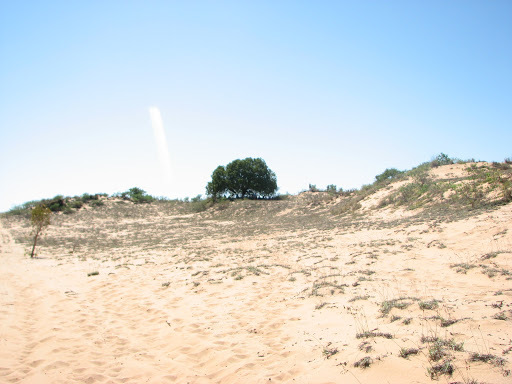 I was incredulous at this realisation… one tree taking up a whole sand dune. How old must this tree be? I asked P about the tree when we were night fishing for salmon. How old is that jigal on the dune? “As old as that sand dune,” he told me. This tree must have seen a lot of sun and moon sets. J came and sat with this tree for the day. Another friend tried to sleep next to it and had bad dreams and the sensation of being choked. Maybe it’s just a daytime tree. These mamara called to us women in different ways. They are part of this living country which speaks to us, shows us through feeling how to be with this country.